Pietro Vannucci, il Perugino was actually (despite his nickname) born in Città della Pieve. He almost certainly trained in Florence under Andrea del Verrocchio. He is first documented in Perugia in 1475, when he was paid for what must have been a minor commission in the Palazzo dei Priori. Yet, he emerges as a fully mature artist by 1479, when Pope Sixtus IV commissioned frescoes from him for the Cappella della Concezione of old St Peter’s, Rome (destroyed in 1602). He went on to work in the Sistine Chapel (see below) in ca. 1481-2. Perugino maintained a workshop in Florence from at least 1487 until 1511. He also maintained a workshop in Perugia, probably from ca. 1495: his ownership of a workshop in Piazza del Sopramuro (now Piazza Matteotti) is documented in 1502-9. ✴the altarpiece (1499-1503) of the Marriage of the Virgin in the Cappella del Santo Anello of the Duomo. Perugino failed to keep up with the rapid development of artistic taste from ca. 1500, and his reputation in Florence suffered badly when his Polittico dell' Annunziata (1504-7) for SS Annunziata there was badly received. He nevertheless continued to dominate the art scene in Perugia for some twenty years. ✴As noted above, Sixtus IV commissioned frescoes from Perugino for the Cappella della Concezione of old St Peter’s in 1479. ✴The work commissioned by Cardinal Domenico della Rovere for his chapel in Santa Maria del Popolo, which is generally attributed to Pintoricchio, seems to have been executed at some time between 1478 and 1482. It includes an altarpiece of the Adoration of the Magi that is closely related to the altarpiece (ca. 1470) from Santa Maria dei Servi,Perugia, which is attributed to Perugino (see below). Pintoricchio might well have collaborated in Perugino’s frescoes ca. 1481-2 in the Sistine Chapel (see below). According to Giorgio Vasari, Andrea d’ Assisi, l' Ingegno was the most promising of Perugino’s’s assistants in the Sistine Chapel of the Vatican Palace. Vasari also cited Andrea’s collaboration with Perugino in relation to the frescoes of the Collegio di Cambio in Perugia and at the Portiuncula in Assisi (see below). The early works of Raphael owe much to Perugino: Giorgio Vasari commented that, had Raphael not signed what is now called the Mond Crucifixion (1502-3) in San Domenico, Città di Castello, it would have been attributed to Perugino. In 1521-4, the aged Perugino completed Raphael’s unfinished fresco (ca. 1505) in San Severo (see below), and this serves as a sad reminder of the extent to which his style had been overtaken. ✴Lattanzio di Giovanni (died 1534), who had previously worked for Bartolomeo Caporali. It is not known how long the formal association between these artists lasted, by they frequently worked together during the rest of their careers. They do not have seemed to have worked again with Perugino after 1495. Giorgio Vasari saw this altarpiece, which he attributed to the young Perugino, in Santa Maria Nuova. It was probably commissioned for an altar in the Servites’ earlier church of Santa Maria dei Servi, which was demolished in 1540. Agostino Tofanelli selected it for the Musei Capitolini, Rome in 1812, but it was returned to Perugia in 1817 and restored to Santa Maria Nuova in 1820. It was moved to the Galleria Nazionale (Room 15) in 1863. The attribution to Perugino is not universally accepted, but it is nevertheless supported by the fact that the face of the young man on the extreme left, who wears a red cap and looks at the viewer, seems to be a self-portrait. Dating to the early 1470s is supported by the fact that the face of the king with the green cloak was re-used for St Roch in a fresco (1476 or perhaps 1478) that is dated by inscription and also attributed to Perugino, which came from San Francesco, Deruta. It therefore seems likely that this was among Perugino’s earliest important commissions in Perugia. The Madonna and Child are depicted at the entrance to the stable with the aged St Joseph to the right. The baby Jesus blesses the oldest of the three kings, who kneels before Him, while the other two kings and their courtiers stand to the left. All of the male faces seem to be portraits, probably of members of the noble family that commissioned the work (possibly the Baglioni) and their associates. The scene is set in a rocky landscape. This processional banner came from the Franciscan Convento di Farneto, outside Perugia and was transferred to the Galleria Nazionale (Room 9) in 1867. The banner, which is generally accepted to be an early work by Perugino, depicts the Pietà with SS Jerome (with his lion) and Mary Magdalene against a landscape. Many scholars believe that Perugino belonged to the so-called Workshop of 1473, which produced the important panels depicting miracles of St Bernardino of Siena that are now in the Galleria Nazionale. (Follow the links in the page on the Workshop of 1473 for more details). The Decemviri (ten magistrates) originally commissioned an altarpiece for their chapel in the Palazzo dei Priori (now part of the Galleria Nazionale) in 1479 from Pietro di Galeotto. The main panel was to depict the Madonna and Child with SS Laurence, Louis of Toulouse, Herculanus and Constantius, while the smaller upper panel could be of a subject of his choice. Although the contract stipulated that a steep penalty would arise unless the work was delivered within two years, it remained incomplete at the time of Pietro’s death in 1483. In 1484, the commission passed to Perugino, who was to complete the main panel within four months and to paint the upper panel within a year. The subject of the latter was to be the Madonna della Misericordia with portraits of the Decemviri, who would presumably be depicted sheltering under her cloak. When Perugino left the city a month later without having started the work, the commission passed to Sante di Apollonio, who executed the upper panel, which depicted the Madonna della Misericordia. He seems to have lost the commission in 1485, and he died in the following year. In 1485, the priors renewed Perugino’s contract. However, they paid him only a nominal sum, and nothing further seems to have happened until 1495, when the contract was again renewed. This time, Perugino received a substantial sum, in return for which he was required to repaint the existing upper panel, replacing the Madonna della Misericordia with a Pietà, and to complete the main panel within six months. This he seems to have achieved. ✴The main panel depicted the Madonna and Child on an elevated throne under an arcade, flanked by SS Herculanus, Constantius, Laurence and Louis of Toulouse. 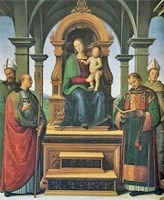 Perugino’s signature appears at the base of the throne. ✴The smaller upper panel depicted Christ in the coffin, in which the half-length figure of Christ displays His wounded hands, painted over the earlier Madonna della Misericordia by Sante di Apollonio. The altarpiece was moved to the new chapel on the first floor of the palace in 1553. Napoleon's commissioner, Jacques-Pierre Tinet selected the main panel for confiscation in 1797, and a copy (ca. 1799) by Domenico Garbi was put in its place. Antonio Canova recovered it in 1815 but, despite the requests of the city authorities for its return, it remains in the Pinacoteca Vaticana, Rome. In 1835, the altarpiece (with the copy of its main panel) was removed from the first floor chapel but the components remained in Perugia. Perugino's original upper panel and the copy of the main panel were subsequently displayed separately in the gallery. They have recently been reassembled in the original frame and in the original location. The provenance of this panel, which is attributed to Perugino, is unknown before 1847, when it belonged to Colonel George Lindsay Holford in London. It has formed part of the Collection of the Fondazione Cassa di Risparmio di Perugia since 1987. The panel depicts the Madonna and Child enthroned with two cherubs: the central figures are based on those of the Decemviri Altarpiece (above). Recently discovered documentation records that the Confraternita di San Bernardino made a payment to Perugino in 1496 for the painting of a processional banner, for which the confraternity received a donation from the Commune. This banner would have been kept in the Oratorio della Confraternita di San Bernardino near Porta Eburnea until 1537, when the confraternity merged with the Confraternita di Sant’ Andrea and moved to the Oratorio dei SS Andrea e Bernardino. The banner was moved to the Galleria Nazionale in 1879. The usual name given to the work derives from the fact that it was, for a period, confused with a second banner (now lost) that the Confraternita di Sant’ Andrea (which was also known as the Confraternita della Giustizia) commissioned in 1501. The banner depicts the Madonna and Child on a cloud with angels, with SS Francis and Bernardino kneeling in a meadow below. St Francis commends to the Virgin a group that includes the priors and their families as well as members of the confraternity. The road behind them leads to Porta Eburnea and the buildings of Colle Landone that were subsequently demolished. 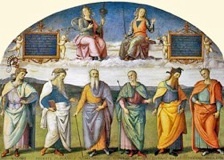 The Confraternita della Consolazione commissioned this banner from Perugino, using a series of subventions from the Commune. When not in use for processions, the banner adorned the altar of their oratory in the crypt of Santa Maria Novella (later San Benedetto dei Condotti). However, this was considered to be an unsuitable location for such a prestigious work of art and, in 1500, the confraternity built a new oratory, the Oratorio di Santa Maria della Consolazione in what is now Corso Garibaldi to house it. When the confraternity was suppressed in 1797, one of its members hid the banner in his home in order to avoid confiscation by the French. The confraternity re-opened and merged with the Confraternita di San Pietro Martire in 1801, and the banner was moved to the Oratorio di San Pietro Martire. It entered the Galleria Nazionale in 1863. The banner, which has been recently restored, depicts the Madonna and Child seated in a rural landscape and flanked by a pair of praying angels, with members of the confraternity kneeling to the sides. This small panel, which is on loan to the Galleria Nazionale, was first documented in Perugia in 1742, when it belonged to Count Costantino Ranieri. It is widely attributed to Perugino. There is more discussion about its date: the date given here is from the catalogue of the recent exhibition referenced below (pp 236-7). The inscriptions that form part of the predella of this altarpiece record that Berardino di ser Angelo commissioned it in 1500 for his family chapel in Sant’ Agostino. (By the 18th century, this family had acquired the surname "Tezi"). The altarpiece is usually attributed to Perugino, but was generally regarded as a workshop production until its recent restoration revealed its quality. The altarpiece was specified as the exemplar for an altarpiece that Bartolomeo di Lorenzo commissioned from Eusebio di San Giorgio for Sant’ Agostino in 1506. Perugino’s altarpiece remained in its original location until 1653, when it was moved and subsequently dismembered. ✴The main panel, which depicts the Madonna and Child with SS Nicholas of Tolentino and Bernardino, remained in the church until 1863, when it was transferred to the Galleria Nazionale. ✴The predella, which depicts the Last Supper, seems to have been a workshop production. It was probably stolen during the French occupation of Perugia in 1797. It turned up in a private collection in Frankfurt in 1833, when it was sold to the Staatliche Museen, Berlin. It is illustrated in this page from Wikipedia. Angelo di Tommaso Conti commissioned this altarpiece, which is signed by Perugino and dated, for the Cappella di Sant' Anna in Santa Maria degli Angeli (or dei Fossi). It is unusual in the number of members of the holy family, both adult and infant, that are included in the composition. It was moved to the Ospedale di Santa Maria della Misericordia in 1789. Napoleon's commissioner, Jacques-Pierre Tinet selected it for confiscation in 1797, and it was sent from Paris to Marseilles in 1801. It is now in the Musée des Beaux Arts, Marseilles and illustrated in the Web Gallery of Art. Mattia di Tommaso da Reggio built the frame for this huge, double-sided altarpiece for the high altar of Sant’ Agostino in 149-1500. Its design (in modern reproduction here) seems to have been based on that of Pintoricchio’s altarpiece in Santa Maria degli Angeli (or dei Fossi). The altarpiece was dismantled in 1654 and its panels were displayed in various locations in the church. They were moved to a store room when the church was restored in 1794. Napoleon's commissioner, Jacques-Pierre Tinet selected seven of them for confiscation in 1797, and they were subsequently dispersed (see below). The remainder were moved to the Galleria Nazionale in 1863. ✴The restoration of the panels in the gallery in 1997 allowed their original locations within the frame and the sequence in which they were painted to be established. ✴The twelve panels in the double-sided predella were integral to the structure of the frame, and they were probably in place by 1512. Since Perugino had been away from Perugia for most of the period 1502-12, these panels were probably largely the work of his workshop. ✴The panels that formed the central register of the side of the altarpiece facing the nave seem to have been installed soon after 1512. ✴The panels that formed the central register of the side of the altarpiece facing the friars’ choir seem to have been painted and installed over an extended period that probably culminated in ca. 1520. ✴The last substantial panels to be painted seem to have been those of the two upper registers. The probable reconstruction is illustrated in this page in Wikipedia. ✴SS Herculanus and James (now in the Musée des Beaux Arts, Lyon). A panel of the Virgin Annunciate that was the pendant to the Archangel Gabriel was among those taken to France in 1797, but was subsequently lost. ✴SS Mary Magdalene and Jerome (exhibited here, illustrated above), with St Bartholomew above (now in the Museum of Art, Birmingham, Alabama). In 1502, the friars of the Convento di Monteripido used money that had been left to them in a will some five decades earlier to commission this double-sided altarpiece from Perugino. ✴On the side facing the friars in the choir, mourning figures of the Virgin, SS Mary Magdalene, John the Evangelist and Francis and angels were painted to form the backdrop to the polychrome wooden Crucifix (ca. 1460) attributed to Giovanni Tedesco that already decorated the high altar. ✴On the side facing the congregation, the Apostles witness the Coronation of the Virgin, which takes place in a mandorla supported by angels. (The friars specified the enthroned Christ and the Virgin with four saints below: the final composition reflected that of the Coronation of the Virgin (1486) that Domenico Ghirlandaio had painted for the high altar of the church of another Observant Franciscan convent, San Girolamo, Narni. ✴There was also a predella, subsequently lost, that included representations of SS Bernardino da Siena and Bernardino da Feltre. It is sometimes argued that Perugino would have been unable to complete the commission quickly, since he was away from Perugia in late 1502 and for most of 1503. However, Raphael used parts of the composition of the backdrop to the Crucifix for his altarpiece (1503) of the Crucifixion with Saints (Mond Crucifixion) in San Domenico, Città di Castello (illustrated here). This suggests that the Monteripido Altarpiece was at least designed by 1503 and that its execution might have been largely delegated to the workshop. Agostino Tofanelli selected the altarpiece for the Musei Capitolini, Rome in 1812. It was returned to Perugia in 1817 and ceremonially translated to its original position on the high altar in 1822. It entered the Galleria Nazionale in 1863 and was restored in 1994. The frescoes were recorded in 1674, by which time they were badly damaged. Those on the side walls were subsequently lost. The fresco of the Adoration of the Shepherds was detached in 1856 and is now in the Galleria Nazionale. It was restored as far as possible in 1994. ✴the fresco (1503) in San Francesco, Montefalco. It was probably painted shortly afterwards. Giorgio Vasari saw this altarpiece by Perugino on an altar in San Francesco al Prato that was presumably dedicated to St John the Baptist. Although it was listed among works to be sent to the Musei Capitolini, Rome in 1812, it was subsequently decided that it should remain in the church. It entered the Galleria Nazionale in 1863. ✴The composition, and in particular the figures of SS Francis and Jerome seem to derive from the Madonna di Loreto (1507), which Perugino painted for Santa Maria dei Servi and which is now in the National Gallery, London (see below). ✴Mariano de Ser Austerio used the figure of St John the Baptist in the altar frontal (1512) that he painted for the Cappella di San Giovanni Battista of the Collegio di Cambio. 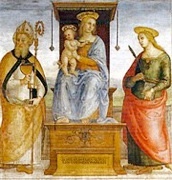 This fresco of the Madonna and Child enthroned with SS Herculanus and Constantius, which is generally accepted as a late work by Perugino or his workshop, came from the kitchen (cucina) of the Palazzo dei Priori. It was detached in the 19th century and moved to other locations in the palace before passing to the Accademia di Belle Arti and then, in 1861, to the Galleria Nazionale. It was restored in 1947. Adriana Signorelli commissioned this altarpiece from Perugino for the chapel in Santa Maria dei Servi in which her husband, Francesco di Bartolomeo Graziani had been buried some three years earlier. The Servites took it to Santa Maria Nuova when they moved there in 1540. Adriana left further money in her will of 1544 for the restoration of the altarpiece, which had been struck by lightening, and her brother Panfilo paid for this work in the following year. The panel entered the Galleria Nazionale in 1863. ✴The main panel is based on the fresco (1496-1500) of the Transfiguration that Perugino had painted in the Collegio del Cambio, with the addition of a rural landscape and a mandorla of seraphim around the transfigured Christ. It is possible that there were originally one or two others that have been lost. Giuliano and Sinibaldo Martinello commissioned this altarpiece from Perugino in 1505 for their chapel in San Francesco al Prato. It was not completed until 1518, the date inscribed on the base of the column to which the saint is tied, and Perugino was forced to litigate in 1520 to obtain the final payment. The altarpiece was moved from its original location at some time in the 16th century, and subsequently suffered serious damage. It therefore escaped requisition by the French, and was transferred to the Galleria Nazionale in 1863. The earliest surviving reference to this panel, in which it is attributed to Perugino, dates to 1784, when it was in the sacristy of Sant' Ercolano. It passed to the Compagnia di San Martino in 1836 and entered the Galleria Nazionale in 1863. St Jerome is depicted as a hermit, kneeling in contemplation of a Crucifix, with a stone in his hand and his lion and cardinal’s hat on the ground nearby. The figure is set in a rural landscape. This banner, which is attributed to Perugino, came from the Oratorio dei SS Girolamo, Francesco e Bernardino. It depicts the Blessed James of the Marche holding a reliquary of the Blood of Christ. It belonged to a confraternity that the Blessed James had founded in 1445. It was noted in an inventory of the possessions of the confraternity in 1532, but not in an earlier one from 1517, suggesting that it was commissioned thereafter. The oratory was demolished in 1797, at which point the banner was moved into the adjacent church. It was moved to the Accademia di Belle Arte in 1810 and is now in the Galleria Nazionale. The extensive fresco cycle in the Sala dell’ Udienza of the Collegio di Cambio is the masterpiece of Perugino. According to Giorgio Vasari, his main assistant was Andrea d’ Assisi, l' Ingegno. The side walls contain frescoes of allegories of civic virtues using humanist iconography that seems to have been the work of Francesco Maturanzio, the secretary to the Priori delle Arti. ✴the Transfiguration (on the left). The vaults depict personifications of the signs of the zodiac in tondi against highly patterned backgrounds. At the centre, a team of four horses pulls Apollo's chariot across the sky. 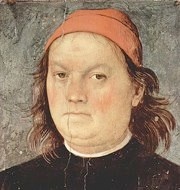 A frescoed self-portrait of Perugino (illustrated above) appears as a panel hung from the left wall. The inscription by Francesco Maturanzio praises the artist: "If the art of painting was lost, he rediscovered it. If it was not yet invented, he brought it to this point". The history of this huge polyptych from the high altar of the church of San Pietro begins in 1483, when an Olivetan monk, Giovanni Domenico da Verona was commissioned to build the frame. Perugino was commissioned in 1495 to paint the panels and to gild the frame. The altarpiece was installed at some time before 1500, the year in which the high altar was re-consecrated. The altarpiece was removed and dismantled in 1608, during the re-modelling of the church. From this time, the main panel of the Ascension was hung in the apse, and the other panels were distributed within the church. The probable reconstruction of the original disposition is illustrated in this page in Wikipedia. ✴The main panel of the Ascension of Christ was sent to Lyon in 1811 and is now in the Musée des Beaux Arts, Lyon. ✴The lunette of God the Father with angels was installed in the Parisian church of St Gervais in 1811. It was reunited with the main panel in the Musée des Beaux Arts, Lyon in 1952. ✴Tondi of the prophets David and Isaiah, which possibly came from protective doors that covered the altarpiece, were sent to Nantes in 1809 and are now in the Musée des Beaux Arts, Nantes. ✴The predella panels of the Adoration of the Magi, the Baptism of Christ and the Resurrection were sent to Rouen in 1803 and are now in the Musée des Beaux Arts, Rouen). ✴Antonio Canova recovered the predella panels of SS Benedict, Placidus and Justina (the patron saint of the Cassinese Congregation) in 1815, when they were secured for the Pinacoteca Vaticana, Rome. Predella panels of SS Scholastica (the sister of St Benedict); Herculanus; Peter Abbot (the founder of San Pietro); Constantius; and Maurus remained in San Pietro until 1811, when Agostino Tofanelli secured them for the Musei Capitolini, Rome. They were returned to Perugia in 1815 and are now in the sacristy. This fresco in San Severo was executed above and to the sides of a niche containing a terracotta statue (15th century) of the Madonna and Child. Although it survived the demolition of the church in 1748, it was badly damaged during the upheaval. As noted below, Perugino took over the commission from Raphael. 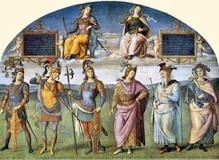 According to an inscription to the left of this fresco, Raphael painted the upper part in 1505, in the time of the Prior Ottaviano di Stefano da Volterra. Some authorities query this early date, given the mature style of the fresco, but others see no reason to dispute it. This was the only fresco commission that Raphael ever won in Perugia, and it is the only certain work of his that is left in the city. It was incomplete when he left the city for Rome, but the monks did not give up hope of further progress until he died there in 1520. ✴SS Romuald, Benedict Martyr and John the Monk on the right. (The last two were Camaldolesian monks from Benevento who were martyred in Poland in 1005 and whose cult was confirmed in 1508). ✴SS Gregory the Great, Boniface and Martha on the right. (St Boniface was a Camaldolesian monk and relative of the Emperor Otto III who was martyred in Poland in 1009). This highly venerated image is now in a gilded neo-Gothic tabernacle (1855) on the pillar in the Duomo. The inscription records the fact that Cardinal Fulvio della Corgna, Bishop of Perugia ordered its restoration in 1564 after it had been damaged by rising damp. This panel has traditionally been attributed to Giannicola di Paolo, [but it has been more recently attributed to Perugino ??]. This fresco is on a wall in what is now the Cappella della Consolazione of the nunnery of Sant’ Agnese. The nuns have always venerated it because they believe that it protects their community. 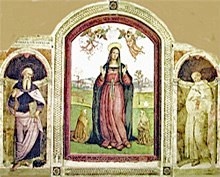 It is in the form of a frescoed triptych, with the orant Virgin with two kneeling nuns in a landscape, flanked by SS Antony Abbot and Antony of Padua. Its recent restoration has confirmed its attribution to the aged Perugino. This restoration recovered the original inscription, which gave both the date and the names of the donors: Eufrasia degli Arcipreti and Teodora di Pier Matteo (presumably the nuns who kneel on either side of the Virgin). It also established that the fresco remains on the wall on which it was originally painted (contradicting earlier theories that it had been detached from its original location and moved here). The wall in question seems to have been open to the elements in the nuns' cloister until the construction of the chapel. As noted above, most of the panels of the San Pietro Polyptych (1495-1500) have been dispersed. Other works by Perugino in Perugia that are now elsewhere are described below. Bernardo di Giovanni da Corneto commissioned this altarpiece from Perugino for his chapel in San Francesco al Prato. It was one of three works in the church that Napoleon's commissioner, Jacques-Pierre Tinet selected for confiscation under the Treaty of Tolentino (1797). Antonio Canova recovered it in 1815, but it remained in Rome. For the last 40 years, it has been housed in the Pope's private library, and it is therefore sometime called “il Perugino el Papa”. However, it was exhibited in the Museo Vaticano for a short period in 2004 after its latest restoration. The Confraternita di San Giuseppe commissioned this important altarpiece from Perugino for the Cappella del Santo Anello in the Duomo. (The commission had originally been given to Pintoricchio in 1489, but he had failed to start the work, having left Perugia). Perugino’s work was still incomplete in december, 1503, but was probably finished shortly thereafter. Napoleon's commissioner, Jacques-Pierre Tinet selected the altarpiece for confiscation in 1797, and it was duly sent to Paris. It was transferred to Caen in 1804 and is now in the Musée des Beaux Arts, Caen. Perugino seems to have based this composition on that of his fresco (ca. 1480) of Christ giving the keys of Heaven to St Peter in the Sistine Chapel, Rome (see below). The marriage takes place in front of the Temple. St Joseph holds the rod that flowered in order to identify him as the bridegroom selected by God: the other suitors stand behind him, and one of them breaks his own rod because it failed to flower. Raphael’s Marriage of the Virgin (1504), which was painted for the Altare di San Giuseppe in San Francesco, Città di Castello, was closely modelled on Perugino’s altarpiece in Perugia. In 1507, Giovanni di Matteo di Giorgio Schiavone, a carpenter who had rented a workshop from the friars of Santa Maria dei Servi, left money for the endowment of a new chapel in the church that became known as the Cappella Schiavone. He also bequeathed money for an altarpiece, and the friars, who were named as his executors, almost immediately commissioned Perugino to paint it. (The artist charged an unusually low price, suggesting that he may have had a professional relationship with the deceased carpenter). The original frame was recently discovered in the deposit of the Galleria Nazionale, confirming that the altarpiece only ever comprised this single panel. It depicts the standing Virgin and SS Jerome and Francis. It was moved to Santa Maria Nuova in 1540, when it was placed on an altar that subsequently belonged to the della Penna family. Fabrizio della Penna bought the altarpiece from the friars in 1821 for his private collection, and included a copy by Giuseppe Carattoli that replaced it on the altar as part of the price. He sold the original to the National Gallery, London in 1879. The copy remains in situ in Santa Maria Nuova. are attributed to Andrea d' Assisi, l' Ingegno or (more recently) to Perugino. Vasari wrote his account in 1568, just a year before the choir was demolished. The frescoes were plastered over shortly after, when the choir chapel was demolished to make way for the present church. They were rediscovered early in the 19th century and heavily repainted. The lower half of the fresco of the Crucifixion survives in situ, although the upper part was destroyed when the choir was demolished. It was restored in 1998, when some of the damage inflicted by the repainting of the 19th century was reversed, and Vasari’s attribution of the work to Perugino was confirmed. The surviving part depicts the leg of Christ on the Cross, with St Francis and a group of women, including the swooning Madonna, to the right. To the left, a young boy leads two Pharisees to the scene and one of two mounted soldiers draws their attention to the Crucified Christ. These detached frescoes were painted on the curved exterior wall of the apse of the Cappella della Portiuncula. 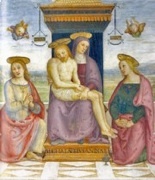 Like the Crucifixion that remains in situ there (see above), they are attributed to Perugino (or to his workshop). They were plastered over in the 16th century and re-discovered in the early 19th century. The artist Antonio Castelletti is documented as restoring the frescoes of the “Cappella dell’ Annunziata” in 1828, and this seems to have involved the effective repainting of these frescoes. They were detached in 1975 and are now in the Museo della Portiuncula. These two altarpieces from the Convento di Sant’ Antonio da Padova are now in the Pinacoteca Civica. ✴This altarpiece depicting St Antony of Padua is signed by Perugino. The inscription also records that it was commissioned by Bartolomeo di Maraglia, who was taken prisoner by the French at the the Battle of Marignano in 1512 (when in the pay of Gian Paolo Baglioni). Bartolomeo di Maraglia is depicted in armour kneeling at the feet of the saint giving thanks for his release. ✴This altarpiece of the Madonna della Misericordia with saints is attributed to Perugino. It depicts the Madonna della Misericordia sheltering SS Stephen and Jerome and two kneeling donors (presumably a married couple). This fresco is behind the Altare di San Giovanni Battista, in the Oratorio della Nunziatella. The surviving part of the inscription records that Giovanni Battista Morganti commissioned it. The rest of the inscription, which was still legible in the 19th century, recorded the date and the fact that it was the work of Perugino. The main scene of the baptism of Christ is set in a landscape and witnessed by angels. God the Father looks down on the scene from the lunette above. This fresco on the counter-façade of San Francesco is framed by fictive architecture so that it appears to be in a large aedicule over an altar (now removed). This is almost certainly the work for which Brother Francesco Augusti, the Guardian of San Francesco, paid Perugino in 1503. The main scene of the Nativity is based on a fresco of this subject by Perugino in the Collegio del Cambio, Perugia. God the Father is in the fictive lunette, with figures of the Annunciation in the spandrels above. On November 1489, the Opera del Duomo resolved to complete the decoration of the the Cappella Nuova, since the forty years’ hiatus that had occurred since the project had been started was “a great disgrace” for them. Some six weeks later, “master Pietro Perugino, a painter famous throughout Italy”, who was then in Orvieto to discuss the project, was appointed to complete the vaults. However, despite a series of pleas from the Opera del Duomo, Perugino proved elusive, except for short visits to Orvieto in March/April and September/October 1491. The relevant documents for the latter visit include a reference to “Andreas alias Ingegnio, famulus ... magistri Petri” ((Andrea d’ Assisi, l’ Ingegno, apprentice of Perugino). A fresco of St Michael from the Cappellina di Santa Maria Maddalena, which no longer survives but which is known from photographs, is sometimes attributed to him. The Opera del Duomo sent a letter to him in 1492, threatening to appoint another artist in his stead, to which Perugino’s Roman patron Cardinal Giuliano della Rovere (the future Pope Julius II) replied in equally strident terms. (Perugino painted a polyptych for Cardinal Giuliano for SS Apostoli, Rome at this time). Despite numerous subsequent requests, Perugino never returned to Orvieto, and the Opera del Duomo seem to have finally abandoned hope in March 1499, when a final written appeal to Perugino to return to Orvieto received a negative reply. Nothing is known about what, if anything, Perugino painted in this period. The restoration of the chapel found no direct evidence of any work done before 1499. However, while the scene of the Angels with instruments of the Passion in the the vault nearest the altar (opposite Christ in Judgment) is attributed to Luca Signorelli (see below), two of these angels (illustrated here) are sometimes attributed to Perugino. These panels were commissioned for two altars (1515) that Rocco di Tommaso da Vicenza built on the pilasters that flank the presbytery of Santa Maria Maggiore. Rocco di Tommaso first negotiated a contract for their altarpieces with Giannicola di Paolo in 1520, but this contract was never honoured. The work was then commissioned from the elderly Perugino in 1521. ✴the Madonna and Child with SS Blaise and Catherine of Alexander. Both works are dated by inscription and each names the donor (respectively Michelangelo Andine and Giovanni Bernadelli) in an inscription along the base of the throne. ✴figures of SS Peter and Paul in painted niches to the sides. •the finding of Moses in the bullrushes. As Vasari comments, all three were “thrown to the ground in preparing the wall for the [Last] Judgement of the divine Michelangelo” in 1537-41. The composition of the fictive altarpiece is known from Vasari’s description and from a drawing (15th century) that is now in the Albertina, Vienna. ✴in 1482, payment was agreed with the same four artists for the decoration of four bays (presumably one each) that had been completed. ✴that work began on the last ten bays of the chapel following the contract of 1481. Two of these last ten frescoes, which were on the entrance wall, were destroyed in 1522 when the lintel over the door collapsed, and they were subsequently repainted. ✴Moses declaring his Testament to the people of Israel. ✴According to Vasari, the Florentine Rocco Zoppo painted two of the figures of early popes in the frieze above the narrative frescoes. He is documented in Perugino’s Florentine workshop in 1496-1501; some frescoes in San Girolamo, Spello are attributed to him; and he is said to have died in 1508. ✴Vasari recorded that Pintoricchio worked with Perugino in Rome at the time of Sixtus IV, and it entirely possible that this collaboration included the work in the Sistine Chapel. •the death of Moses, by which he probably meant one of the now-lost frescoes on the entrance wall. •he may have contributed figures in the scene of Christ giving the keys of Heaven to St Peter. Return to Art in: Assisi Bettona Foligno Montefalco Orvieto Perugia Spello Trevi.